This article is based on my own research on the web and snippets of building my own projects. Separating facts from opinions can be quite a challenge but one thing is definite, there’s lots of information on the net, lots of schematics, tons of opinions and buying the real McCoy is often cheaper than making your own. Cautionary Note: Effects pedals do need to comply to FCC regulations pertaining to radiation. Read here. FCC case against EHX here. In the forums I read this covers digital equipment. I do not have the facts before me but an astable multivibrator running above 9kHz may be constituted as digital although it is used in an analogue circuit. For those new to stomp boxes and electronics in general I do recommend this web site DIYstompboxes…. Before you even embark on a stomp box or effects pedal project ensure that you have a local supplier of aluminum (aluminium) die-cast or sheet metal boxes which will withstand abuse. Yes, you will stand on it and yes, they do get thrown around. Having said that, if you know a machinist or metal worker with a sheet bender, all the better. My own opinion is that in many listening tests the older analog effects pedals sound cleaner than digital – it is an opinion though. Digital electronics has made capturing the settings for a multitude of effects a breeze, even including analog sounds. See cautionary note above. Snob value climbs into almost every forum – do not be afraid to say that you have a cheap pedal, it’s about you and not them. Each person to their own style. Hearing is like a fingerprint – what sounds you hear may not necessarily be what the other hears. (or perceives to hear). Our hearing is all different. Blind listening tests have blown many an ego apart. There has been a lot said about germanium transistors and diodes (germanium semiconductors in general) used in older pedals. Their switch-on parameters are different to silicon, they switch-on at a lower voltage (0.2V to 0.3V unlike silicon’s 06V to 0.7V), they are not cheap and they do not like heat. The die hards of audio prefer them for their soft switch on characteristics, again the great semiconductor vs triode and pentode debacle. The truth is, they do sound different. We’ll find a way around this later. Cost of making versus buying the ready made product. 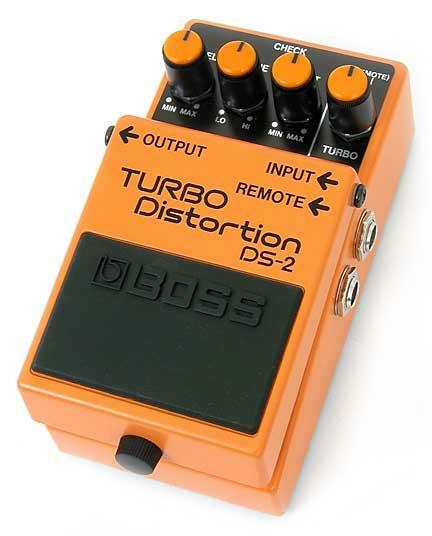 In Cape Town, South Africa my build of the famous BOSS DS-2 cost me close to 100 U$ compared to the locally available unit for 95 U$. Making a one-off circuit is always more expensive than mass production. I could have got an equivalent Joyo for 60 U$ locally. The big difference is in the enjoyment of after build modifications. The circuit is fairly comprehensive. I do believe it to be an infringement of copyright so will not post any details here suffice to say I doubt I would do it again. The Free Information Society has a wonderful selection of schematics under Schematic Archive (right hand side menu). Thinking local: South African website by Benjamin Craig selling under the name of Craig: Craigamps – interview with Benjamin Craig, Doughnut Magazine – nice read and insightful for those wanting to build their own stuff. So you decided to build your own against all advice and now run into a small problem – where to get a germanium diode? On my side of the world a small signal diode cost 1.40 U$ but I urge you to read this very well written article on Germanium Vs Schottky diodes on the Rezzonics website. The reality is people want to build their own. The reality is that there are suppliers and if you know what you want there are even kits out there. Here are some of the better known, although maybe outside your country or region you can get a general idea as to what is outside there, pricing and of course – knowledge on the products. If anyone wants to add stores to this list please contact us at parts-ring. Almost 9 times out of ten the sound that you want through a listening test will be available to you on You Tube. There are comparison tests and there are stand offs. I have come across some engineers whom are totally biased because they work for the company doing the marketing of that particular product and then of course you get the muso – sometimes even more biased. Do the rounds, listen to the different pedals, synths, whatever but also note that certain amplifiers also sound different. They are designed to sound different. Trying to get that Knopfler or Gilmour sound is never easy – they have their systems often re-engineered to sound different. This is not a cheap exercise but this is where your expertise as a DIYer comes in. If you are working on battery powered equipment the permutations to circuitry is endless and you won’t get electrocuted. Don’t try this with valve gear though. Although copyrighting of schematics must be a very difficult and expensive exercise there are copyrights on certain material so be cautious. BOSS which is part of the Roland company I am sure will not be happy to hear you have been infringing their patents and selling off cheaply. Reverse engineering products nowadays with laser and 3D printers is a very common practice and should not be encouraged but such is the way of the human, if it can be done it will be done. The three major websites which have really great reviews and product documentation is Sweetwater.com, SoundonSound.com and Musiciansfriend.com. You Tube will have whatever product you want to listen to reviewed and tested to the hilt, somewhere. Germanium diodes can be obtained for a cheaper price elsewhere but do try Schottky and LED technology. If you do need germanium try to buy in bulk to get discount. They can always be used elsewhere in any event – they haven’t disappeared entirely. Because I am a Gilmour (and Waters) fanatic I had to conclude with the great sound of Pink Floyd on one of the highest ranked stompboxes of all time, the BOSS GT-100. Glenn is pretty phenomenal too!